Previously on Doctor Who —709 episodes ago — old William Hartnell was in the Tardis noting that there's "quite an arctic storm out there, pretty soon we shall be having visitors". That's what we're reminded of in a scratchy clip at the start of this year's Christmas episode — a re-creation of Doctor Who's early days, with David Bradley playing Hartnell, refusing to regenerate and thus (somehow) soon rubbing shoulders with Peter Capaldi's Doctor. The theme of regeneration is, of course, the big one — for yes, this Christmas will be the handover to Jodie Whittaker's Doctor. Before that, though, are more time-hopping escapades involving a thoroughly confused First World War captain (Mark Gatiss) in 1914 no man's land. It's a rip-roaring hour of Whovian pleasure, the undoubted highlight of Christmas Day. APA 6th ed. : Jackson, James (2017-12-23). The 12 TV treats of Christmas - an armchair guide. The Times p. Saturday Review, p. 10. MLA 7th ed. : Jackson, James. 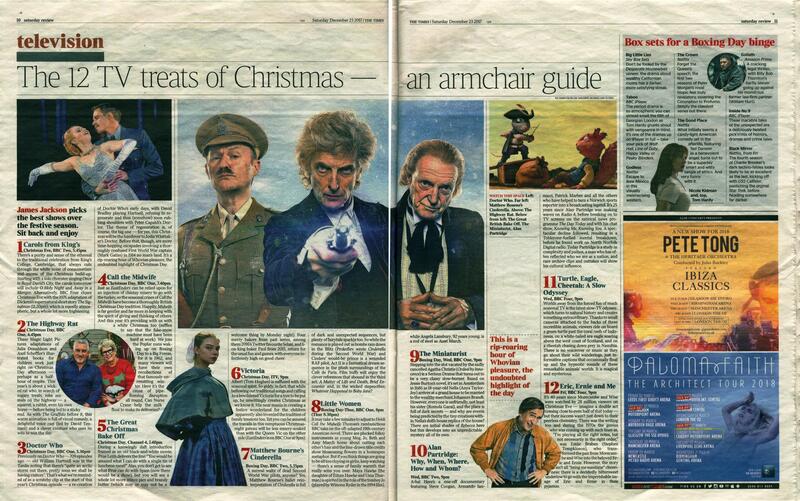 "The 12 TV treats of Christmas - an armchair guide." The Times [add city] 2017-12-23, Saturday Review, p. 10. Print. Turabian: Jackson, James. "The 12 TV treats of Christmas - an armchair guide." The Times, 2017-12-23, section, Saturday Review, p. 10 edition.